A few dozen people are huddled around a volunteer giving a tour of the historic Georgetown Steam Plant on a recent Saturday morning. The group is standing next to towering turbines that were used to power the city’s streetcar network in the early 1900s. 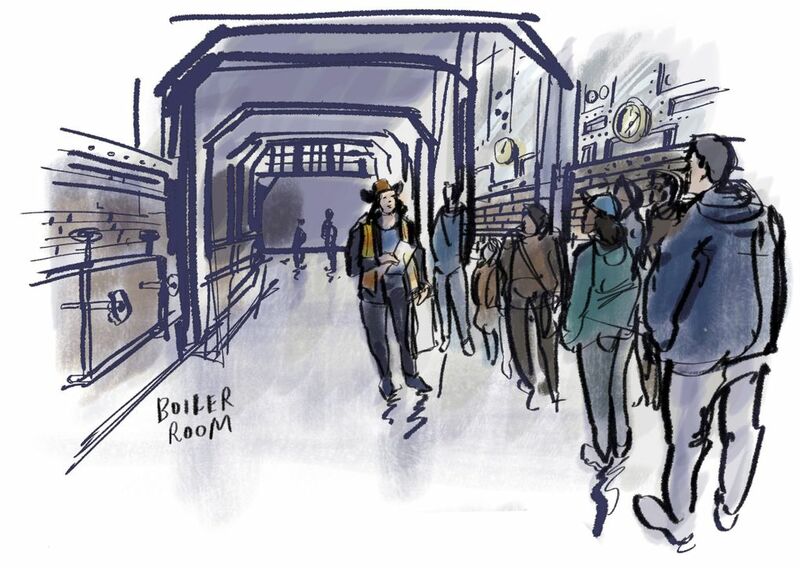 Next, the guide leads everyone to the boiler room in the upper level through a zigzagging metal staircase. It’s chilly and dark inside but I’m focused on drawing and taking notes. 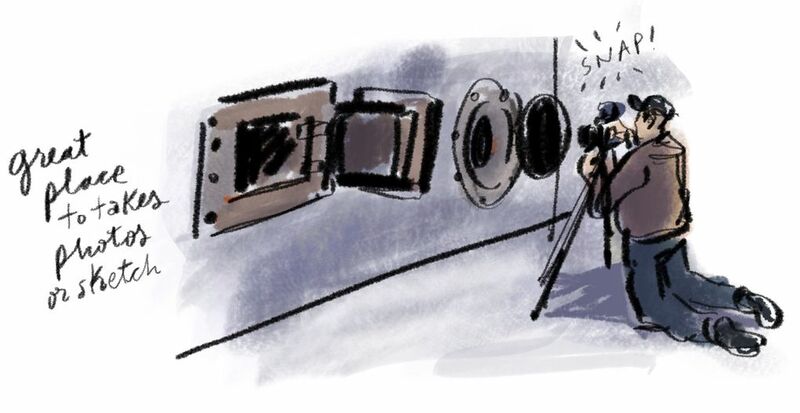 Some people have brought cameras and tripods and are taking snapshots through the open hatches that seal the boilers. Can you imagine this whole machinery running “full steam” back when the plant opened in 1907? 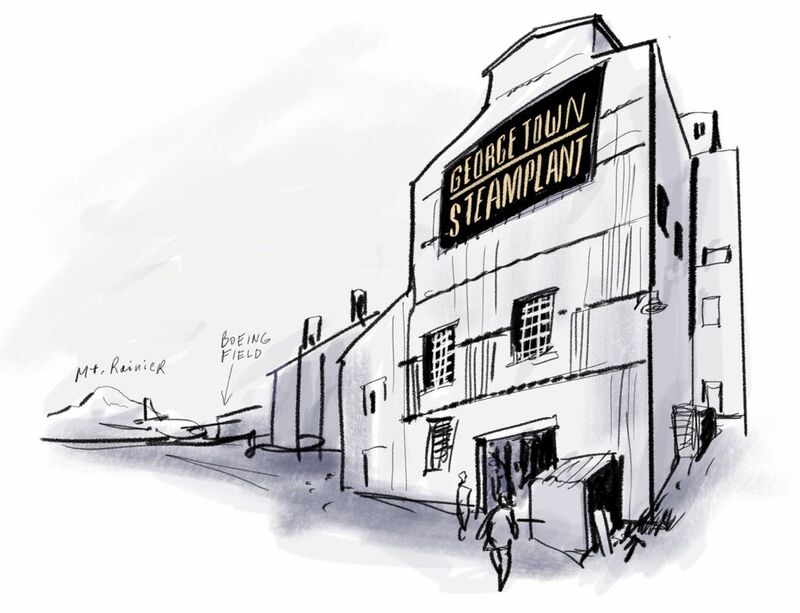 Seattle Times news artist Gabriel Campanario has been capturing Seattle's places and people in hand-drawn sketches for more than a decade. To see past columns, visit the Seattle Sketcher home page. 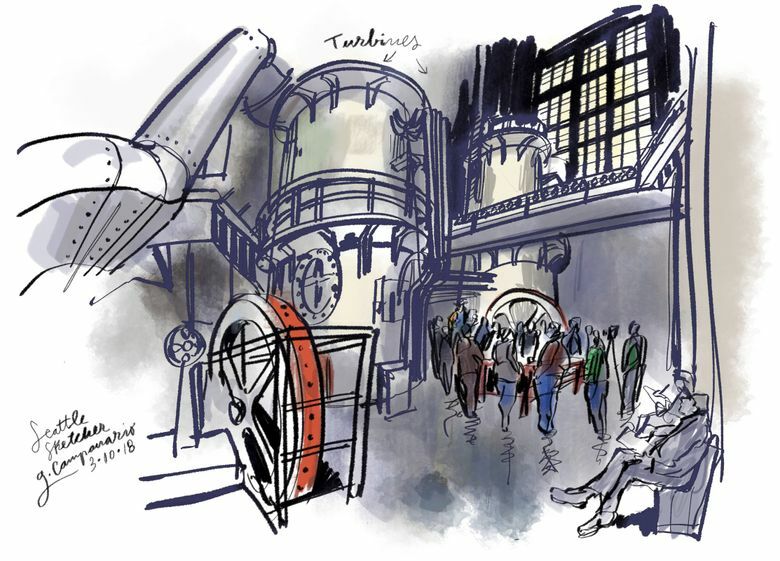 Prints, notecards and a book of Campanario’s sketches are available for sale through The Seattle Times store. You may also fill out an illustration request to order a specific image. This fantastic maze of steel pipes, cylinders, axles and levers was once state-of-the-art technology. Now it feels very much like a stage or a museum exhibit. In fact, that’s what it may become. While that happens, the local utility still facilitates free public tours of this extraordinary city landmark every second Saturday of the month (including Saturday, April 14), from 10 a.m. to 2 p.m. If you haven’t visited yet, I highly recommend it. For more information, visit www.seattle.gov/light/georgetownsteamplant/.